But, we're more than great tasting, good for you real fruit smoothies. We offer the gamut of high quality, healthy alternatives to fast food. We feature toasted wraps, gourmet sandwiches and specialty salads using the Boar's Head meats and cheeses. Why Boar's Head? Because they have no fillers, no preservatives and all flavor! But, product is the beginning… we are famous for our unparalleled hospitality that creates experiences that make for VERY loyal and satisfied customers that come back often and tell others about us! We offer a smoothie for every taste profile – from low-fat smoothies made with real fruit and sweetened with Turbinado – the purest form of sugar in the raw, to Splendid Smoothies ® for those watching their calories. The Splendid Smoothies give all the flavor you deserve in a 24 oz smoothie, but they're under 200 calories. New in 2008 is our line of Supercharged Smoothies featuring the super fruits acai, pomegranate and goji to beef up your antioxidants. For that indulgence we all need, we even offer dessert smoothies. Of course, all of our real-fruit smoothies can be amped up with a supplement to fit your mood or nutritional or dietary need. Smoothies are an anytime of day treat! Toasted Wraps, Gourmet Sandwiches and Specialty Salads…Soup too! 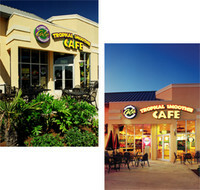 At Tropical Smoothie Café, we give you the perfect alternative to fast food and it's good for you. It's the place people go to Eat Better Feel Better! We offer innovative menu items like Jamaican Jerk Chicken Wrap right along side our signature toasted wraps like King Caesar and Buffalo Chicken. Tempt your taste buds with a specialty salad like a Thai Chicken Salad –spicy and delicious! The Cafes offer Boar's Head chef-inspired fresh soups, too… and top off your meal with freshly baked cookies made with Ghirardelli chocolate! With over 10 years of experience under our belt and more than 270 locations in 33 states, this is a system that works. We have programs and systems in place to select only the most passionate and qualified Franchisees. We have state of the art technology to ensure the keys to any successful business – two-way communication and live data to track and manage your business! Our vision and mission statements don't sit in a book or desk somewhere – they live and breathe in the community. The energetic and tropical décor package puts our customer in vacation mode from the second they open the door until their last soothing sip of their favorite real fruit smoothie. It is definitely another way they can Eat Better Feel Better at Tropical Smoothie Café. We have a commitment to innovate and stay ahead of the trends…not just with our products, but with support systems and training programs for all Franchisees. We also look for ways to engage the customer and give back to the community by introducing our very own holiday in 2007 – National Flip FlopDay. Every June 21st we celebrate summer by inviting the first 500 customers wearing flip flops to enjoy a free 24 oz Jetty Punch on us. In 2008 we partnered with Camp Sunshine to help families of children with life threatening illnesses attend Camp through our National Flip Flop Day promotion. We have both Area Developer and Franchisee opportunities available in many markets across the United States.